While this product might sound like a simple distributor, the pipe distributor comes with many different sizes, shapes and purposes. There are straight-pipe, T-type, H-type, ring-type and ladder-type pipe distributors. While the straight pipe is generally used as a pre-distributor above a liquid distributor in a packed tower, the T & H-pipe distributors are used to introduce vapor and liquid in trayed towers. 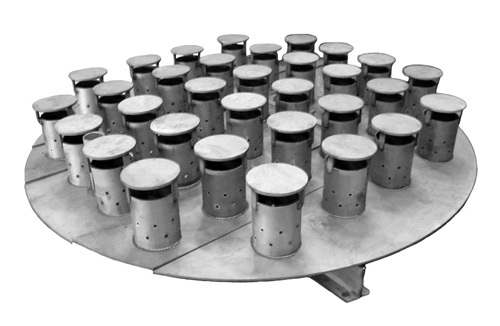 The ring-type pipe distributor is most often applied in a reactor quench sections. The ladder pipe is primarily used in packed towers as the primary distributor for a packed tower. The spray nozzle liquid distributor is a specialized ladder-type distributor. 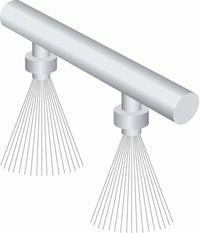 Instead of using only distribution holes, the holes are replaced with full-cone spray nozzles. The distributor is designed to create overlapping circles of liquid, which ensures that the entire area below the distributor is covered in liquid. This distributor consists of a main header and laterals with downpipes and spray nozzles. These liquid distributors are usually used in heat transfer services and when a medium quality of distribution is required. This type of liquid distributor has long been the primary device selected for standard performance random packing where liquid flow rates are moderate to high levels. 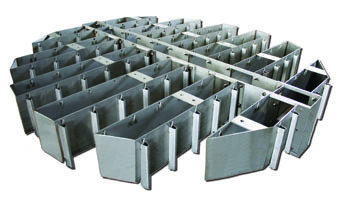 These styles of liquid distributors consist of a perforated deck with holes or drip tubes for the liquid and round or rectangular risers for the vapor. O/R distributors with holes in the floor generally attain at least a 2:1 turndown range for liquid distribution. To achieve higher turndown ranges, such as 10:1, the holes are replaced with drip tubes with multiple levels of holes. The O/R distributors with drip tubes are also used in moderate fouling systems since they provide a zone for solids to settle out away from the distribution holes. The O/R type distributor is also a good re-distributor with the addition of riser hats. The AMACS High Performance Liquid Distributor was developed for glycol dehydration in order to allow low liquid flow rates, high liquid viscosity and high turn downs. These units have a built in level adjustment to allow precise leveling in the field. Designed for easy installation, the AKM-100 is available in standard and exotic alloys like Hastelloy, Titanium and Zerconium. Vertical intergration in manufacturing allows for total quality control from start to finish and means a better, more consistant product at the best price. 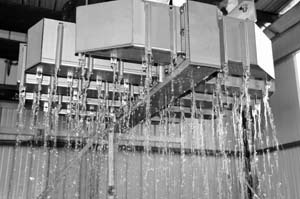 Prior to shipping, all distributors are water flow tested at our on-site facility. Customers are welcome to witness this flow test for themselves.